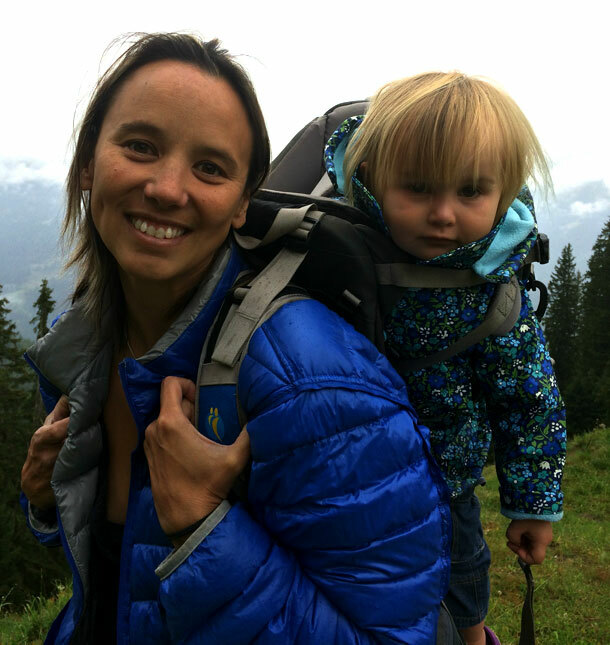 Our gear expert, Michelle Jana Chan, puts five of the best baby-carrying backpacks for outdoor activities to the test. A child-carrying pack gives you the freedom to head for the hills hands-free (or use trekking poles) while your child is safe and supported. 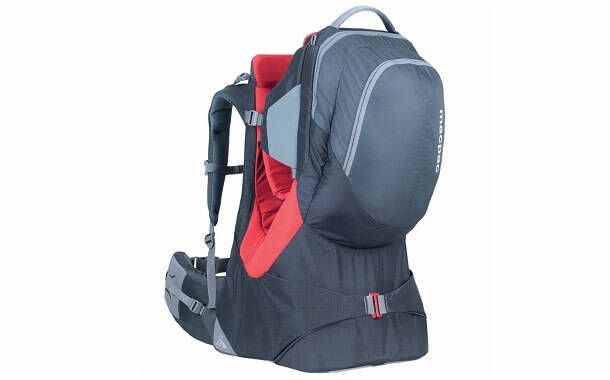 When choosing a pack, a lightweight one is a priority – you’re already carrying the weight of a child – as is good weight distribution (a pivoting hip belt, padded straps and lumbar support). It is important to have an easily adjustable pack that can be tailored to a man’s or woman’s frame, as well as adapt to a growing child. Generous storage, cleverly positioned pockets and good weatherproofing also make for an easier ride. As soon as a baby can sit up unassisted (usually around six to nine months old), they are ready to be placed in a carry pack. Note that the child must be loaded before lifting the pack. Then, after just a few clicks to secure the pack, you can hit the trail. This is easy to adjust to the adult’s torso length, and the child’s harness, saddle and foot stirrups are adaptable, too – allowing for a broad range of adult and child sizes. The child’s harness was the simplest to secure without having to rummage for straps and clips. 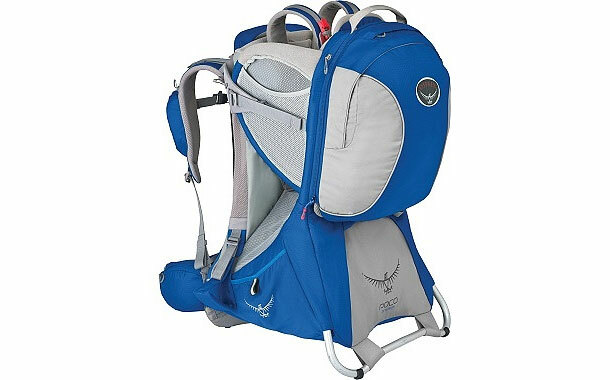 The main zipped compartment is a good size and there are easy-access side pockets, a zipped hip belt, shoulder harness pockets and a padded changing mat. There is a sleeve containing a SPF50-rated sunshade and an internal sleeve for a hydration bladder. 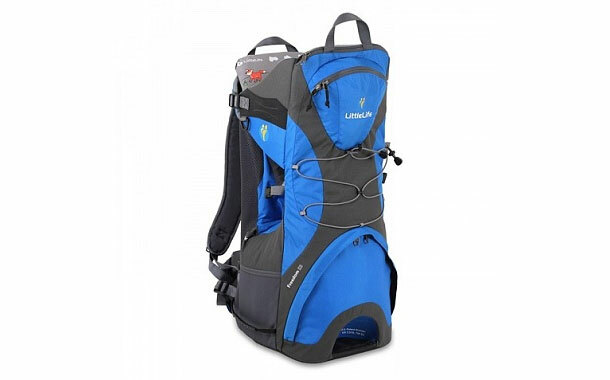 For warm weather, this pack has excellent ventilation.The downsides are that it is a whole kilogram heavier than the lightest pack on this list and does not pack well. Well thought out and comes up trumps on support, adjustability and storage. This ultralight pack may feel flimsy but it stood up surprisingly well in testing (except for developing a squeak). It is fully adjustable with decent support and a pivoting hip belt; the light padding on the shoulder straps and waist belt is good enough for less-challenging terrain. This pack’s light weight lends itself to trekking in hotter weather, enhanced by its ventilated back system and easy fold-out sunshade. It comes with multiple pockets and an elastic cord system for holding a wet jacket, but the side bottle pockets are poorly positioned low down, which means the bottle spouts rub against the child’s (dirty) shoes. What this pack lacks is stability on the ground; you must prop it up when loading/unloading the child by putting a foot in a cavity (which cuts the storage volume of the base compartment). It also does not fold away very neatly. Good value, performs well on easy treks. This fully adjustable pack can be snugly fitted to the wearer’s torso length. Its shaped shoulder straps and comfortable pivoting hip belt provide a good balance of padding levels. There is lots of zipped storage, including a hip belt pocket, stretch side pockets, a back pocket and a roomy base compartment, plus an open sleeve for a hydration bladder or sunshade. For the child, the height and width of the saddle and stirrups can be adjusted, even with the child seated. The padded five-point safety harness is secure but there is a lot of clipping. The soft face pad is detachable and washable. Cleverly, the design allows the child to clamber in and out while the aluminium frame with kickstand keeps the pack stable. There are robust grab handles and it’s foldable for easy transport. The child’s favourite. They love being able to climb into the pack independently (not to mention the hidden teddy bear). 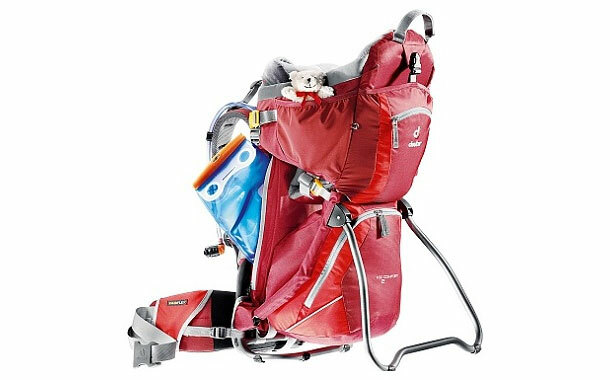 A stable, secure pack with adjustable torso support and saddle height, which mean it can be adapted to different wearers and also as the child grows. It is easy to clip the child in, and the important safety mechanisms are highlighted orange. A soft towelling, teddy-shaped face pad is detachable and washable, and there is a headrest with good neck support. The load-bearing hip belt is well padded, yet there is minimal cushioning elsewhere. However, its suspension system provides good support on uneven terrain. The large base compartment contains a padded changing mat and there is an integrated sun cover and spacious belt pocket. Oddly, there are no side pockets. Using a hinged stand, the pack stands upright on the ground with tough grab handles. Like the Deuter, side access allows the child to clamber in and out. This is the heaviest of all the packs. A technical pack that excels in some areas but is lacking elsewhere. This hefty pack has an easily adjustable harness to fit men and women, but its prominent lumbar and over-padded waistband will not suit everyone. The child saddle can be adjusted to three different heights. 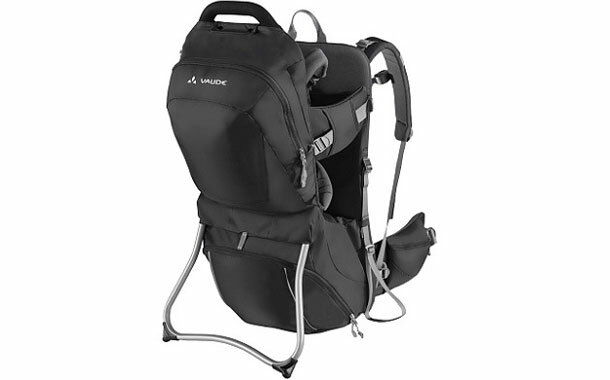 There are padded leg areas, and the shoulder straps and head pad are detachable and washable. A more supportive neck pillow can be bought separately. It provides good storage with a large base compartment, elasticated pockets on each side, a hip belt pocket and a clever “secret” stowaway under the cockpit. There are two zippered front pockets, one of which can hold a sunshade (bought separately). It is also compatible with an excellent rain cover and flattens down well for transport. A smart foldaway design with excellent weatherproofing (the rain cover must be bought separately).